Dynamics SPC participated in the 117th AFPM Annual Meeting held on March 17 - 19 in San Antonio, TX. We presented The Technology of Safe Resource-saving Operation and Maintenance of Machinery to the Refining community whom the Technology was developed for. Dynamics SPC participated in CERAWeek 2019 held on March 11-15 in Houston, TX. We were excited to meet so many global energy industry leaders at CERAWeek 2019 and establish buisness contatcts with them. The real-time predictive analytics and the AI shaping future were the most hot topics of the event. On March 14th, invited by Association of refiners and petrochemists, Dynamics SPC took part in the official meeting of Russia&CIS Chief Refinery Engineers (Technical Directors) and made a presentation “AI Systems for Refinery Management”. The meeting was held on the premises of the KINEF Production Union in Kirishi and devoted to the topic of “Competitiveness and import independence in the industry”. At the meeting Dynamics SPC presented its new development – a Control Center for Reliability and Operational Efficiency of Refineries aimed at increasing control efficiency of reliability and safe resource-saving operation of production facilities. The presentation aroused a great interest among other participants due to the topicality of the technology developed by a Russian company fully utilizing the concepts of Industrial Internet of Things and Industry4.0..
Merry X-mas and Happy New Year – 2018! We want to congratulate you on the coming New Year and Christmas! colossal success and gigantic incomes! inexhaustible love and great happiness! See you on January, 15! A traditional nuclear industry forum ATOMEX 2017 was held in Gostinyi dvor, Moscow, 14-16 November 2017, organized by Rosatom State Corporation. This year the forum gathered 2932 participants from 12 countries. The forum’s exhibition was presented by 111 exhibition booths by supplier companies and their customers. During presentation panel sessions 56 supplier companies presented their projects, products and services. On behalf of DYNAMICS SPC at the "ACS, Information Technologies" panel session Dr. Alexander Kumenko – Chief of the Monitoring Center and Technical Diagnostics in Power Industry delivered a presentation on "Monitoring Methods of Misalignment and Roughness of Rotors in Turbine Units Operation by means of the COMPACS® system". Besides, DYNAMICS SPC, with a presentation on the COMPACS® condition monitoring system took part in "Perspective technologies and equipment" contest which was held as a part of ATOMEX 2017 among the exhibitors. We would like to thank all the customers of the nuclear industry companies for their interest in the technology and products of DYNAMICS SPC. We are ready to fulfill at the highest level the agreements reached for the long-term cooperation in order to improve safety and resource-saving operation of equipment of nuclear power enterprises with a view to increasing their competitiveness on Russian and international markets. 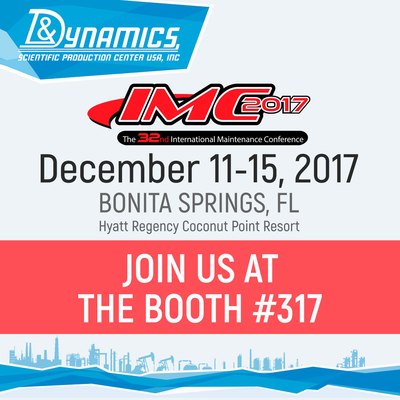 We are looking forward to welcoming you to the IMC-2017, the 32nd International Maintenance Conference, taking place in Bonita Springs, Florida, Hyatt Regency Coconut Point Resort, in December 11-15, 2017. At IMC-2017, the 32nd International Maintenance Conference, you will experience a community of practice and knowledge that is moving beyond “why reliability?” toward effective actions that align to the business process. Participants range from those who are just beginning their journey to those who have won Uptime® Awards for Best Reliability and Asset Management. The thing they all share is an inclination toward action to drive change and performance. A strategy of asset management ensures sustainability and can enhance the probability of success. There is no other community in the world better than the one you will meet at IMC. These individuals have embraced a new context of holistic reliability and work to engage and empower every team member in their organization. You will be on the edge of your seat generating opportunity after opportunity to advance reliability and asset management in your organization. Join us at the booth #317! 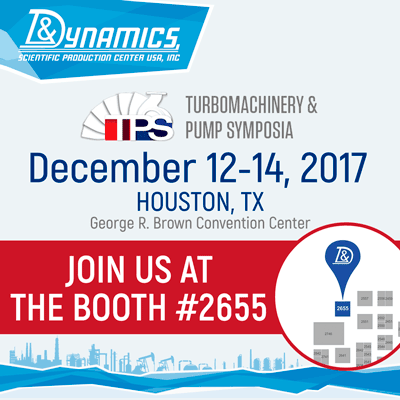 We are looking forward to welcoming you to the Turbomachinery & Pump Symposia (TPS), taking place in Houston, TX, George R. Brown Convention Center, in December 12-14, 2017. TPS is a vital industry event, offering a forum for the exchange of ideas between rotating equipment engineers and technicians worldwide. Now surpassing 45 years, TPS is known for its impact on turbomachinery, pump, oil & gas, petrochemical, power, aerospace, chemical and water industries. Join us at the booth #2655!